Sorry, very sorry I haven't updated in more than a month. Plan to make it up to you guys with this mega post. ENJOY! First time I see Agyness driving! Backstage yesterday at the Alexander Wang show, Agyness Deyn prepared for her first turn down the runway for the spring 2011 season. "I wasn’t going to do the shows, but you know, Alex called, and I love him," Deyn told us. "He killed a cockroach in our house at Coachella, so she owes him," her friend and business partner Fiona Byrne interjected. "We were at Coachella, and we all had a house together," Deyn explained. "There were like seventeen of us," Byrne added. "And Alex came to our party — we had a pretty wild party — and we had this huge insect in this house, and he high-kicked and nearly put his foot through the wall and killed this thing, so I kind of owe him," Deyn said. Though actually, Byrne clarified, maybe he owes her: "He did us a favor by killing the cockroach, but then he left a massive footprint on the wall, which we had to pay for — thanks, Alex." 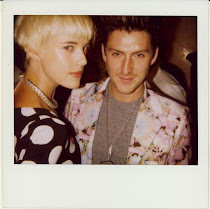 NYFW SS11: A MOMENT WITH AGYNESS DEYN from V Magazine on Vimeo. Agyness with Pixie Geldof, Jaime Winstone, Nick Grimshaw and Lily Allen attending the House of Holland S/S 2011 fashion show during LFW. September 18, 2010.
agy puede serlo todo ! aveces se ve tan hermosa elegante y femenina y despues parece un lindo chico, la amo. Keep posting please, i really enjoy yr posting. I'm a super Aggy's fan. she's so amazing. i love her style, hair and everything ! 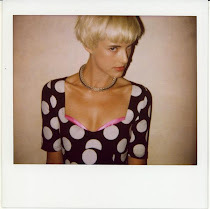 i love your blog and agyness deyn is the perfect model !! i love her style !!!! she is sooooooo beautiful and amazing. I LOOVE her style! Wonderful series ! Thanks for you're visit !!!! bye !